The end of February is drawing near, so you better snag this kit while you stil can!!! I love that the image is like a darker version of the color palette at the bottom of the card...and those big ol' kraft scallops are so fun! This is just adorable! I love the colors and design. I love the big scallops! Those owls are so cute! Just got to your blog for the first time after seeing your card in the Splitcoast Stampers Gallery on FB. 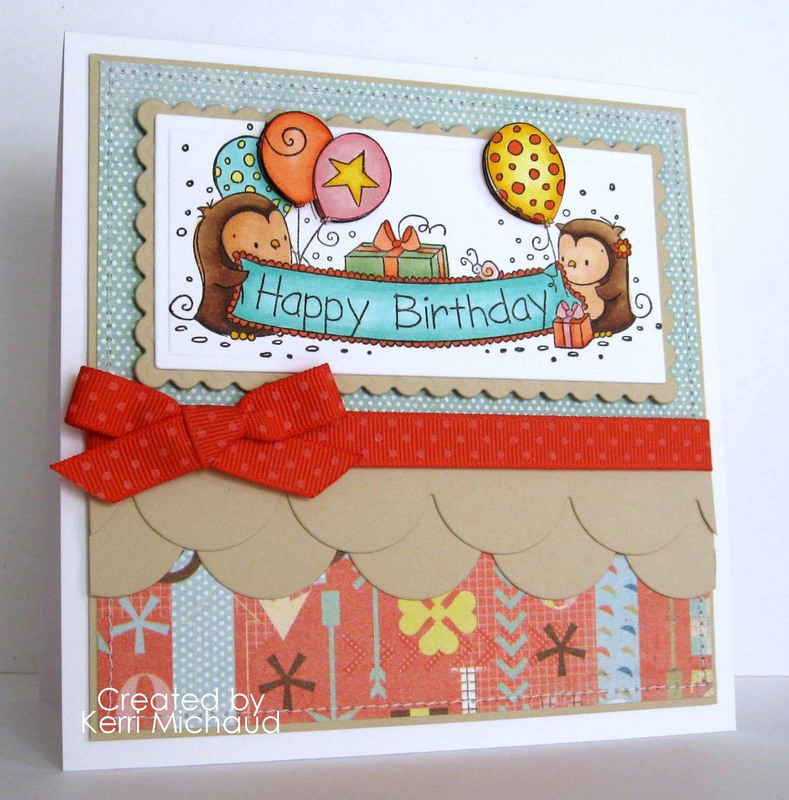 I LOVE, LOVE, LOVE all of your cards ~ cute, whimsical, colorful ~ you are so talented!! Eeeeek! HOW CUTE!!! LOVE these little sweeties and your MAD coloring skillz! LOL!! How stinkin' CUTE is this?!?! Love those little owls and the layered scallops. Oh how cute!! Gorgeous owls and your coloring rocks!! Beautiful! What an adorable card Kerri, super sweet! So sweet Kerri!..Thank you for sharing..
How adorable! Love the layered scalloped border! This is adorable! I love the image and great layout. You're going to have to approve a LOT of comments from me today!! I didn't realize I hadn't commented in almost two months...I've slapped myself on both hands for you! Such a great card! The image is colored beautifully and paired perfectly with this fun paper!